On my way to work every morning, I like to read a book. I have about 30 minutes until I reach my stop so it’s the perfect time to get in a couple chapters of a new favorite. Last week, I was totally engrossed in a book I’ve read a million times when the guy next to me tapped me on the shoulder and asked what I was reading. I blushed and told him that it was just a guilty pleasure book and didn’t give him the title. I realized that I felt guilty for reading a book that probably wouldn’t make the list for the 100 books to read before you die. They’re not the great next american novel or award winning pieces of literature that expand the mind, but they’re books that are throughly entertaining and do wonders to help me quickly escape into another world. So why feel guilty? I get to read for at least an hour everyday to and from work and I read everything from Jane Austen and Marcel Proust classics to young adult fiction from Clare and Collins. Why does it matter what I decide to read on a given day, as long as I always decide to keep reading. 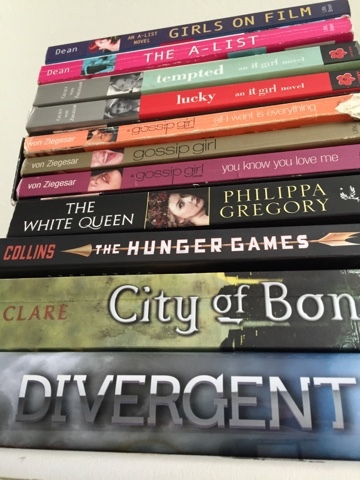 So here are my favorite ‘guilty pleasure’ books to keep you always reading. What’s your favorite guilty pleasure book? I love that you read YA books too. I'm a children's librarian and pretty much all I read is YA and middle grade fiction! My FAVORITE among all favorite guilty pleasure series is "Vampire Academy" by Richelle Mead. Those books are seriously epic and have lots of witty characters, humor, action, and epic love. Highly recommend them. I did read a Gossip Girl book or two, and found those a lot of fun. Right now, I'm working my way through the Pretty Little Liars books, which are lots of fun. I need to read some of these books. I wish I had time each morning to read. Instead I drive.